Incredible Sand Dunes That Go on Forever. It is the 11th of December, and boy o boy have we already been busy today, and we are not finished yet. See our previous blog post from San Miguel de Comondu and San Jose de Comondu. We have just arrived at Mex 1 at Ej. Francisco Villa from San Miguel de Comondu. Here we turn north on Mex 1 for about 25 km. 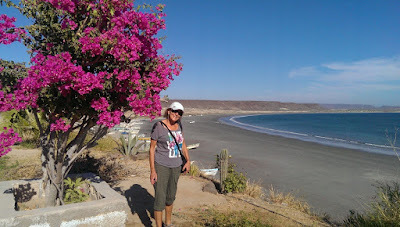 Then we turn west toward Las Barrancas on our way to Scorpion Bay and the town of San Juanico. This road is now paved. It is not going all the way to La Purisima like in the olden days. The drive west toward the Pacific Ocean is flat and the cacti looks grey, almost dead like. We do not know what has caused this? Otherwise the scenery is absolutely fantastic with the huge rolling sand dunes past the inlet of Boca San Gregorio. Here the bridge is out over the inlet La Purisima, and we drive over a temporary contraption. To re-enforce the bridge, by hand, the workers stack rocks in wire cages. They then align the cages along the bridge for support. In San Juanico we are staying at the Las Casitas with John and Christine. It is like a small motel with a common outdoor kitchen that all the guests can use. This is a very nice and clean casita motel and the owners are very friendly. Parking is inside the walls of the property. San Juanico is a quaint little town that is completely off the grid and is geared towards windsurfing. There are also lots of large fishing boats anchored in the bay. We have a walk around town and take in the sights. Lots of houses are for sale here. The town is fairly empty and not much is going on. Apparently the surfing season here is from May through October. That night we have dinner at El Burros and do some people watching. We see all kinds of characters here. In the evening some loud music kept us awake for a while, but we really had a big day, so it did not take us long to fall a sleep. We awake early the next morning. We sure had a good sleep. We get dressed and go for a walk about to find a place for breakfast. We end up at El Burros again, because we could not find anything else open this morning. We had a nice breakfast. I had shrimp omelet with beans and Liz had scrambled eggs and bacon with rice and beans. Really good! After driving around town and along the sandy cliffs we decide to leave San Juanico and work our way back to Ciudad Constitución. We drive into Las Barracas. This is an old fishing town. Except for some workers at a local slaughter house there is not much happening here. A bit sad and depressing. We also decide to drive out to Puerto Adolfo Lopez Mateos (La Soledad). The road out is good and straight. This is a sleepy little town now, but the high season is around the corner when the whale watching start. We are told the the big Gray Whale mamas push the calves up to the boats so they can be petted. In this town, most businesses are closed and are patiently waiting for the Gray whales. Even the 100's of pelicans look bored. Although most people we see seems happy, even though they don't have very much. Back at Misiones RV Park in Ciudad Constitución we make supper and have an early night. But wait... it is Saturday night. The party starts in town with loud music, fire crackers or gun shots and it goes on till early morning when the darn roosters take over with their serenade. Patti comes and wishes us a good trip as we head out. Here are some more pictures from this part of the trip.